Loyola is an all-male, college preparatory school run by the Society of Jesus. It is a fine school with a long and distinguished history, and stellar reputation for both academic and athletic excellence. Those who attend Loyola form a special bond, similar to what colleges might inspire. The friends I made during high school were fierce, fun, and faithful. We were crazy kids, and yet, we were focused and encouraged to excel. I attended our 30th reunion (my first time going to one) and was blown away. At that time, I hadn't been back to formally visit the campus in over a decade so just seeing the place and how it has expanded and developed was breathtaking. All the new buildings and facilities were impressive! Boy, I wish these had been around back when I attended in the 1970s! They say "Out of sight, out of mind." Having lived in the Washington DC or Chicago areas since leaving for college, I pretty much lost contact with all but a few of my Loyola brothers. This was in the 'pre Internet' days, where long distance phone calls were expensive (if you talk as much as I can) and letter writing takes a discipline that most young adults like me lacked. So, the only way I even knew about Loyola's continued growth, and the activities of some of my brothers, was through the Alumni Office (which is VERY active at Loyola). They started forming reunions, but I did not attend either due to scheduling conflicts, traveling costs, or life events. What a mistake, in hindsight! What really made an impression upon me during that first reunion were my fellow brothers, most of whom I hadn't seen or heard from since graduation in 1978. They were doing fantastic things in the world. Many who stayed in the LA area, stayed in touch and maintained their friendships. They formed tutoring programs for students at Loyola; they continued to help the community; they sent their own sons to Loyola to continue the tradition. But mostly, they were still fun guys! I realized that evening just how much I missed that brotherhood, that shared connection. The sense of security and peace that comes from knowing 'you got People' who had your back. I really enjoyed reconnecting with Michael, Darrell, Ricky, Phil, Don, Shannon, Dan, Glenn, Harold, Ozzie, Paul, Patrick, Dennis, PJ, Andy, Tom, Adrian, and a host of others. It was also great to see many of the teachers from our graduating class as well! It was sobering to learn of those who are no longer with us. And I KNEW I would not miss the next one! And I didn't. Thanks to the Internet, FaceBook, email, text messaging, and occasionally some snail mail, many of us continued to stay in touch even though we live all over the country. While I still live far away, I keep abreast of what everyone is up to and keep lines of communication open. And occasionally, while traveling, I have been able to meet up with friends along the way. This reunion did not disappoint! In fact, things got started for me on the morning of the event! My friend Phil had a birthday, so Don got a bunch of us together for a nice surprise breakfast for him at a local restaurant not even a mile from my house in View Park. Man, it was great to walk in and see Michael there, my best friend! And slowly but surely other friends started arriving. Then Phil finally showed, and the look of surprise on his face was priceless! There we all were, joking and laughing (and probably disrupting the quiet breakfast of the other customers there that morning). Later that evening was the reunion itself. We gathered for a Mass to kick off the event. We sang songs from the St. Louis Jesuits that we had grown up with at those Friday services during high school. We heard a wonderful homily from Fr. Mueller, and we prayed for those who now sit at the feet of our Lord. When I was a student, I was often in the choir at the back, so after Communion I felt called to go back and sing with Dennis and Bill. It was awesome! It felt like the old days (except Dennis never sang with us in school. Of course, now he is an amazingly talented performer). We ate lots of different things as the servers came walking through the crowd of alumni engaged in energetic conversation. Many had their spouses present who were amazing and actually appeared to enjoy all us 'guys' and our stories of yesteryear and current goings-on. I was having a blast talking with my friends and trying to navigate so that I could talk to everyone. I didn't succeed in that, but not for lack of trying! What was most noticeable was how easy and comfortable everyone was as we ate, shared stories, and re-ignited our common fellowship. It was very moving. As for me, I just had some soda (tsk tsk but hey, it was a special occasion) and ate lightly but enough to be satisfied. I was running a Full Marathon the very next morning so I had to be 'good'. Many of my brothers were aware of my race the next day and were very complementary of my newly found love of running, as well as the amount of weight I lost since our last reunion. I wanted them to know that I would represent our class proudly that next morning. In fact, I finished that race with a new Personal Record! Go Cubs! I will end with this: "Thank you, my brothers for such a fun and heart-warming reunion experience! You guys are the best -- you were great back in 1978, and you still are. 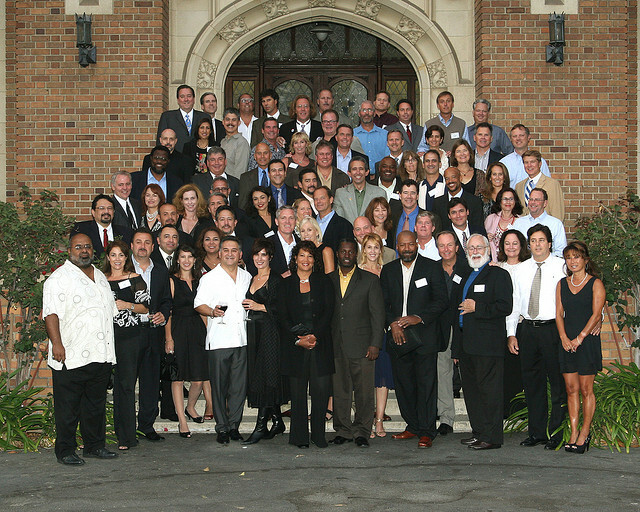 It is always an honor to tell people that I am a graduate of Loyola High School, Los Angeles, Class of 1978. May God continue to bless you, your families, and our alma mater. I will see you again, if not before, then certainly at our 40th!" Posted in Reflection, Reunions, Loyola and tagged with Loyola, Reunion, Reflections. February 8, 2013 by Richard Peete.